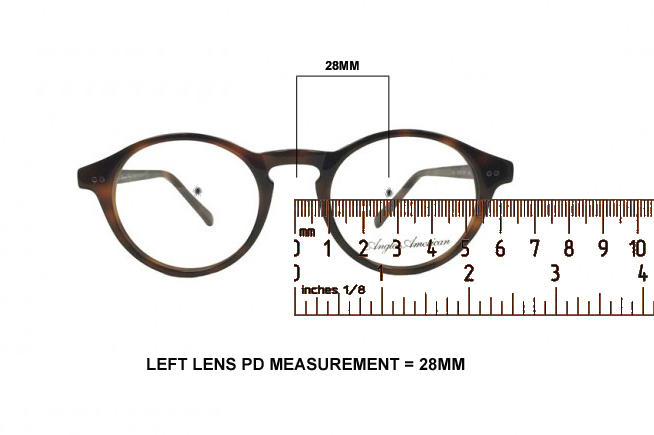 TAKING YOUR PUPILARY DISTANCE MEASUREMENT (PD) AND SEGMENT HEIGHT LENS MEASUREMENT. YOU WILL NEED A MILLIMETER RULER, BLACK SHARP MARKER-FINE POINT OR SIMILAR. WEARER SHOULD PLACE GLASSES IN MOST NATURAL POSITION. ADJUST FRAME FOR PROPER FIT. HAVE A 2ND PERSON MARK (DOT) BOTH RIGHT AND LEFT PUPILS USING MARKER. PERSON SHOULD BE AT EYE LEVEL AND CENTERED, "NOT" TO LEFT OR RIGHT OF WEARER. MIRROR MAY BE USED IF 2ND PERSON UNAVAILABLE. 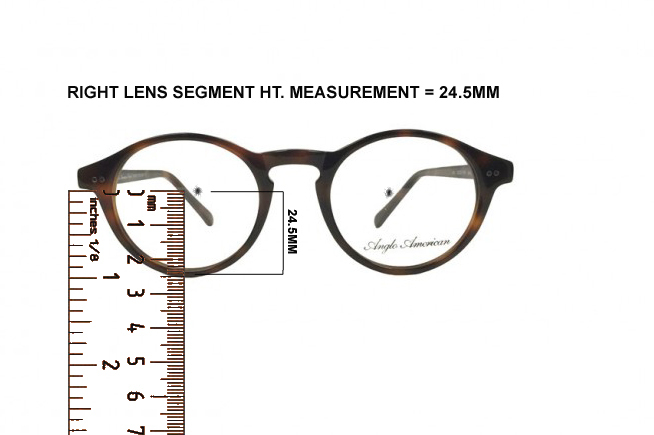 USING MILLIMETER RULER, MEASURE IN MILLIMETERS RIGHT DOT ON RIGHT LENS TO MIDDLE (CENTER) OF FRAME BRIDGE (SEE ILLUSTRATION). REPEAT FOR LEFT LENS. MILLIMETER READINGS SHOULD FALL WITHIN 25-36MM FOR EACH SIDE. USING MILLIMETER RULER, MEASURE RIGHT DOT ON RIGHT LENS TO BOTTOM OF FRAME (LOWEST POINT WHERE LENS MEETS BOTTOM EDGE OF FRAME), (SEE ILLUSTRATION). REPEAT FOR LEFT LENS. MILLIMETER READING WILL VARY FROM 10MM-30MM. (ALSO CALLED SEGMENT HEIGHT OR VERTICAL MEASUREMENT). *PROGRESSIVE AND COMPUTER LENS MEASUREMENTS ARE TAKEN THE SAME AS ABOVE. *LINED BIFOCAL MEASUREMENTS ARE TAKEN FROM THE BOTTOM OF THE EYELID TO BOTTOM OF FRAME. *TRIFOCAL MEASUREMENTS ARE TAKEN FROM THE BOTTOM EDGE OF THE PUPIL TO THE BOTTOM OF THE FRAME. LENS MARKINGS MAY BE REMOVED USING WATER, LENS CLEANER OR RUBBING ALCOHOL.